Q. Where is my nearest EASI Rider Course Instructor? A. EASI operates a network of qualified EASI Instructors covering England, Wales, Scotland and Northern Ireland. If you are able to transport your ATV to a venue you will have a greater choice of training centres; otherwise we will advise you of your nearest EASI Centre that can provide you with a loan ATV to suit your needs. Where demand is light, it may be necessary to travel some 50 miles to an EASI centre but you may be lucky and have one much closer!! Q. Do you have any vacancies for EASI Instructors? 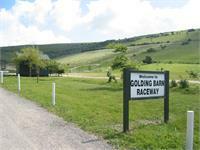 • Access to a teaching / instructing area of 150' (46m) X 200' (61m) on open, level ground of grass, dirt or loose gravel that is free of obstacles and away from wildlife / farm animals. There are still gaps in the UK network because we recruit in response to the growing demand for EASI courses. Please see your coaching choices and details of Instructor vacancies and Instructor training courses. Q. How much does an EASI Rider Course cost? A. 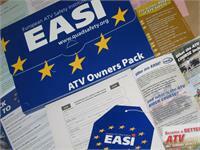 The EASI Rider safety course is available for all ATV riders aged 6 and above for a cost of £180 + VAT per person. However anyone buying a new or used ATV from the leading SIX manufacturers (Honda, Kawasaki, Polaris, Suzuki, BRP and Yamaha) via an authorised UK dealer is eligible for FREE or highly subsidised EASI Rider training, subject to qualifying terms, conditions and availability. Q. How much does a QVC Generic Loading, Towing and Reversing (GLTR) module cost? A. The QVC GLTR module can be added to the EASI Rider introductory ATV safety course to make a day's course, subject to numbers. It cannot be taken on its own. Each GLTR module is organised for a maximum of 4 course participants and costs a total of £260 plus VAT. Q. Can you organise an ATV training course on my land? A. We are always happy to cost an arrangement to help employers train their employees on privately owned land, providing this is suitable for the job. The affordability of such a course will depend on the number of riders involved, any requirement for loan ATVs to be provided and the distance that the nearest EASI Instructor has to travel. By all means ask us to quote for a private course - this will normally need 5-6 riders to be cost effective. Please specify if you wish to add the QVC GLTR (Loading, Towing and Reversing) module afterwards, for a maximum of 4 participants who have previously completed the EASI Rider course. 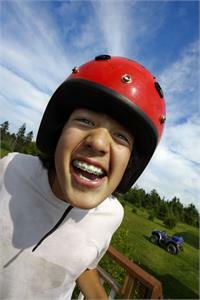 Q. I want to purchase an ATV for my son, aged 12, what can I buy him? A. Regulations in the UK state that children aged 6 - 15 years inclusive should be supplied with ATVs appropriate for their age. This varies for children aged between 6 to 11 year olds and older children aged 12 to 15 years. 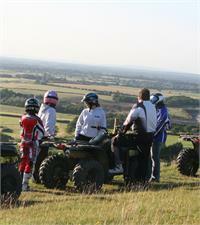 All ATVs supplied in the UK have appropriate warning symbols and stickers on them indicating the riders' age restriction. before purchasing any ATV for a child please talk to your local ATV dealer about this important safety consideration and read the relevant ATV (Safety) Regulations 1989 (No. 2288). Q. Can you organise a loan ATV for me to save me transporting mine to the training venue? A. That depends on the availability of suitable loan ATVs on the date in question, at the nearest venue and subject to the payment of the relevant supplement. Wherever possible, we encourage riders to take their own ATV for familiarity reasons but where this is not feasible we will do our best to organise a suitable loan machine, subject to the supplement being paid to the EASI Instructor on the day. Please note that EASI requires all children to be trained in accordance with the ATV Safety Regulations 1989 (No 2288) described above, regardless of the size of the ATV they may ride at home. Q. Is the EASI Rider Course suitable for my type of ATV? A. The EASI Rider Course is recognised by the HSE and is good for all ATV owners (and/or their employees - See HSE PUWER Regulations) as it teaches the safest riding techniques, personal protective equipment, ATV appreciation and pre-ride ATV safety checks. It also deals with environmental issues and risk awareness. For those owners (and/or their employees) who are using their ATV in an environment where they will be loading, towing and reversing a trailer, please see details of the QVC Generic Loading, Towing and Reversing module which can be added to the EASI Rider introductory ATV safety training course.